After a long absence, indie gigs are suddenly turning up like buses this weekend, with another one (with a pretty outstanding line-up of bands, we must say) happening in Tampin this Sunday. Headlined by Singapore’s international shoegaze stars Stellarium, with more than able support from homegrown noisemakers Akta Angkasa, Ipoh jangle pop and shoegaze heroes The Hollows, Harmacy, The Fridays and lots more, this is definitely one gig that will definitely live up to its name as Noise Pop. 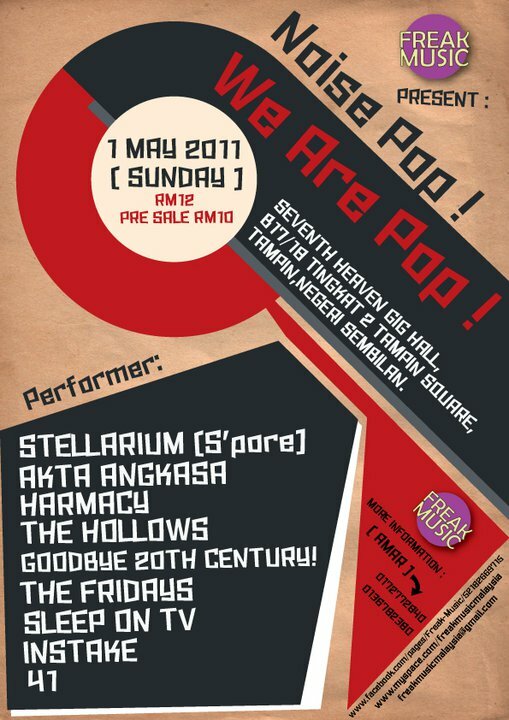 Show starts at 1pm on Sunday, 1st May 2011 at Seventh Heaven Gig Hall, B17/18 Tingkat 2, Tampin Square, Tampin, Negeri Sembilan. Admission is RM12. Check out the event’s Facebook page for more info.